A Glock is an iconic pistol. From Glock’s smallest handgun—the Glock 42—to Glock’s largest handgun—the Glock 17L, there’s a Glock for everyone. Because each Glock is designed for a specific objective, you should consider what you want to use your Glock for. In terms of size, you can choose from subcompact, compact, standard, competition, and longslide. Glock is the dominant handgun for a plethora of armies and police forces around the world from the British and Swedish Armed Forces, which opt for the Glock 17, to U.S. Army Rangers and Marine Corps Forces Special Operations Command, which prefer the Glock 19. While Glock offers over 50 pistols in various sizes, we’ve chosen our 4 favorite Glocks on the market. Depending on the features and characteristics you’re looking for, chances are we’ve included a Glock that’s right for you. The “Baby Glock” may be a compact pistol, but it still packs a punch with a 10+1 magazine capacity. 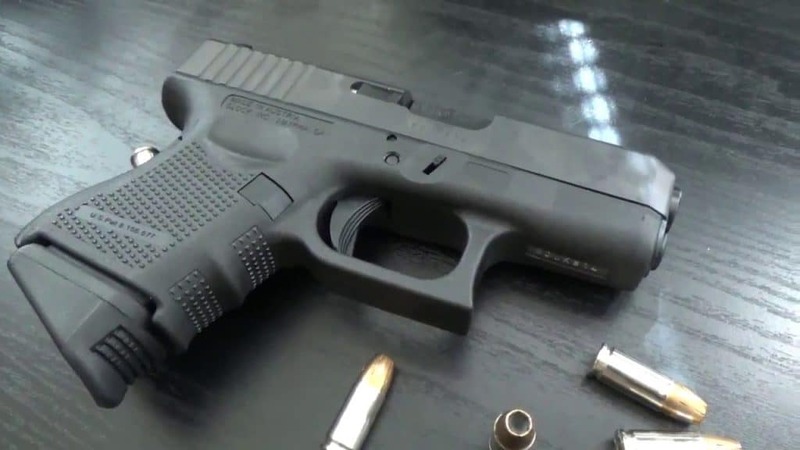 First introduced in 1994, the G26 has become widely sought-after by those willing to conceal and carry or by police officers who need a backup gun. The G26 is just a smaller version of the G17 or G19, so it’s a great starter pistol for those wishing to get into the world of Glocks. Glock designed the G26 to accept G17 and G19 magazines if you desire a slightly larger capacity. And like other Glocks, the G26 is rated to fire +P ammunition. One downside of the G26, especially for those with larger hands, is the relatively short grip. But not to worry. You can purchase a grip extension, and the G26’s amazing capacity as a compact pistol make it ideal to conceal and carry. The G26 is even great for target shooting at the range, as it can even accept Glock’s submachine gun-sized 33-round stick magazine. While the G26 might not be as large as other Glocks, don’t let its smaller size deceive you. The G26 can do anything a slightly larger Glock—G19 or G17—can and more. It’s simple and easy to conceal and carry the G26 without compromising on magazine capacity. Whether you’re a female looking for a more comfortable pistol for small hands or a man who desires a more easily concealable weapon that doesn’t compromise on magazine capacity, the Baby Glock can’t be beaten. Related Reading: Best IWB holsters for Glock 26. First released in 1988, the Glock 19 is just right. It’s not too big, and it’s not too little. Known by some as the Goldilocks Gun and by others as the most popular Glock on the market, the G19 can be used as a concealed carry weapon, a duty gun, and a home defense firearm. Originally designed as a carry gun for undercover police officers or police officers with smaller hands, the G19 has become a great pistol for smaller individuals. It fires a 9mm, so it has less of a recoil of .45. Plus, it’s larger than the subcompact and compacts Glocks, so the G19 doesn’t have as much of a kick. Its 15+1 capacity gives the G19 the perfect in-between size. It’s sufficient for dealing with intruders or threats while concealing and carrying. At the same time, the G19 has smaller dimensions of a standard sized pistol, so it’s not going to be too bulky. Finally, if you want an additional two rounds of capacity, the G19 will also accept G17 magazines as well as run +P 9mm ammunition if you’re looking for a little more oomph. It might be a little large for concealing and carrying as a smaller female, but it does have the flexibility to serve as a concealed carry weapon if needed. The Glock 17 was the first pistol Glock ever made, and it’s held up with the test of time. The G17 is the iconic Glock pistol. While some people insist on carrying it—it’s really a service gun, the G17 is an amazing pistol for target shooting at the range as well as a home defense firearm. In fact, more G17s are currently in use worldwide than any other handgun ever produced. One of the best-selling handguns to civilians, the G17 is the most widely utilized law enforcement pistol throughout the world. The G17 is known for being reliable as well as easy to learn to operate. Ideal for self-defense, the G17 is a great pistol for law enforcement, field carry, and at home. Many people consider the G17 the baseline handgun because it can be found almost anywhere in the world, the ammo is relatively cheap, it will fire in adverse conditions—including when full of sand and water, and it is comfortable for shooters with a variety of hand sizes. Just as the 1911 is an iconic firearm, the G17 has made quite a name for itself since the 1980s. It’s quite a fierce debate about whether the G17 or the G19 is a better firearm. It ultimately comes down to personal preference and use. Some people who need a larger magazine capacity for shooting or law enforcement will opt for the additional two rounds of the G17. But others like the concealability and smaller size of the G19. But this debate probably won’t be solved any time soon! Many Glocks shoot 9mm ammo, but not the Glock 21. If you’re looking for a little more firepower, the G21 is your go-to. With a magazine capacity of 13+1, the G21 is an accurate, indestructible, and reliable combat pistol. Originally created to give shooters the option of more powerful ammunition, the G21 had an edge on the standard .45 pistol, the Colt 1911A1, which only had a capacity of 7 or 8 .45 ACP rounds. Just as popular as the classic G17, the G21 has an extra-large capacity for a .45 ACP pistol. If you’re looking for a deadlier self-defense pistol but want the capacity of a 9mm, the G21 is the answer to that problem. In addition to the G21, there are also variants: the G21SF and the G21 Gen4. Because the 21 SF is a smaller version of the G21 (SF stands for “small frame”), it is more manageable for someone with smaller hands. Similarly, the Gen4 made some updates on the G21 that have increased accessibility and performance. If you’re not sold on the G21, there are several other Glocks that fire .45 ammunition: the G30 and the G36, along with their different variants, and the skinnier G41 Gen4. Just as the G17 is the original 9mm Glock with its smaller relatives—the G19 and the G26, the G21 is the original .45 ACP Glock with its tinier (and thinner) siblings—the G30 and the G36. In sum, the G21 is a great option if you don’t want to give up the accuracy, comfort, ease, and reliability of a Glock or firing .45 ACP ammunition. Because Glock promotes standardization in its firearms, once you’ve fired one Glock, it will be a breeze to fire another. While you’ll obviously have to get used to the differences of a new pistol, Glock makes it pretty easy to feel comfortable with different calibers and different sizes. Whether you’re looking for a versatile pistol or you want something smaller, we hope you’ve enjoyed our list of our 4 favorite Glocks on the market. If you’re more of a visual person, the video below compares the G26, G17, and G19. You can’t go wrong with a Glock due to the ease of using them and their reliability. Plus, the interchangeability of Glock magazines is a great added benefit. Hopefully you’ve figured out which Glock is going to be the next one (or maybe first one!) on your list to buy! Any of these pistols—whether it’s the baby G26, the versatile G19, the classic G17, or the powerful G21—would be a welcome addition to your gun collection. If you enjoyed this article, please share it with a friend. Related Read: Budget Friendly Reflex Sights.